Swasth Bharat, A Trust working for the advocacy on Health since last seven years, is going to pay his tribute to Rastrapita Mahatma Gandhi on his 150th Birth anniversary in a very unique way. Trust has pledged to aware the Nation about three main aspects ( JAN AUSADHI, POSHAN AND AYUSHMAN ) of health in memory of Mahatma Gandhi. Chairman of Trust Ashutosh Kumar Singh said about this. Journey will start from Sabarmati Ashram in Gujrat flag offed by Minister of Chemical and Fertilizers on 30th January, Martyrs day of Mahatma Gandhi, He said. 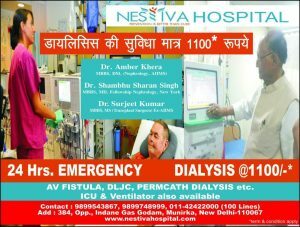 Ashutosh Kumar Singh said, Swasth Bharat in working in the field of awareness for health since last seven years. Including the various campaign like Control Medicine’s Maximum Retail Price, Generic Laiye Paisa Bachaiye, Know Your Medicine, Tulsi Lagaiye Rog Bhagaiye, Know your Doctor, Know your Pharmacist, Swasth Balika Swasth Samaj and dozen more. We have organized a National level Journey in 2017 for the awareness of Healthy Girl child Healthy Society. Coming Journey is the second part of Swasth Bharat Yatra, In which focus will be on to aware people about Generic medicine, Nutrition and Ayushman Bharat. We are living in country where people are not much capable to afford high cost medicine and treatment. This lead them in to below poverty line. So we added JANAUSADHI in our campaign theme on priority basis, So that each and every citizen of country could know about Generic Medicine. Nutrition can also not avoid, Mr. Singh said. Sr. journalist and Chairman of Indira Gandhi kala Kendra Rambahadur Rai said that this yatra is very important for the country. Yatri dal awaring the people of India about ‘sasti dava and sasta ilaj’. He added that we should support this yatra by mind, body and money also. 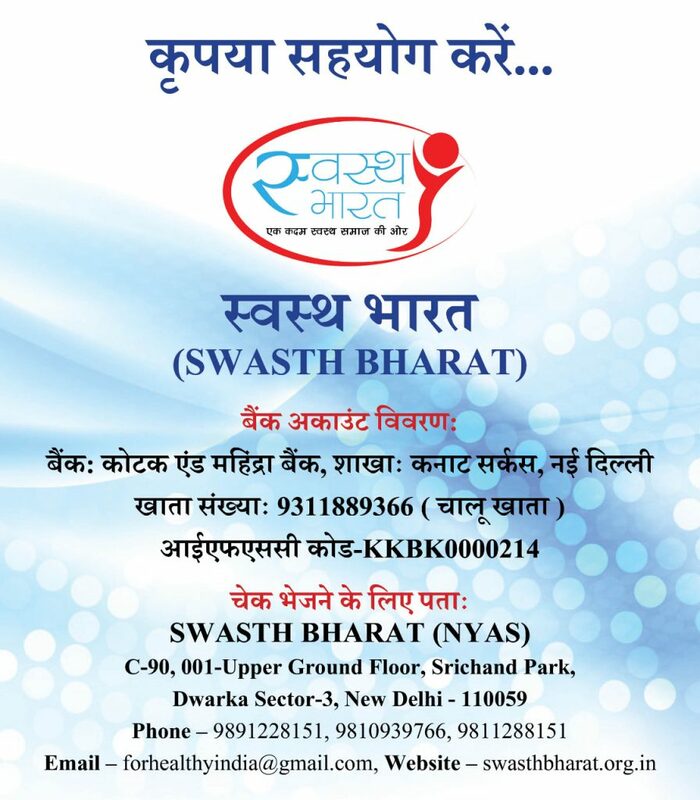 Sri Rai is a patron of Swasth Bharat (Trust). Well Known writer and Gandhi follower, member of Journey Prasun Latant said, 2019 is the 150th Birth anniversary of Mahatma Gandhi. After completing 75 year of QUIT INDIA MOVEMENT, we had started our first Journey, and now During 150th Birth anniversary of Bapu, we are going to start our second Journey paying tribute to him. He said we are happy to announce that PMBJP, Brain Behaviour Research Foundation of India (BBRFI) , Mewar University, Kasturba Health Society, Spandan, Healing Sublime Foundation, Social reform and research organization, Search Foundation and Hindusthan News agency private limited and many more Non-Profit organization are supporting our campaign. Pharmaceutical companies like Synocame, Curetek skin care, Suncare Pharmaceutical, Muscut health series Pvt limited and many more are coming to support us. Co-cordinator of Swasth Bharat Yatra-2, Dhipragya Dwivedi said, Chairman Ashutosh Kumar Singh, Writer and Gandhian Prasun latant, Ayurvedacharya Dr. Som, Sr. 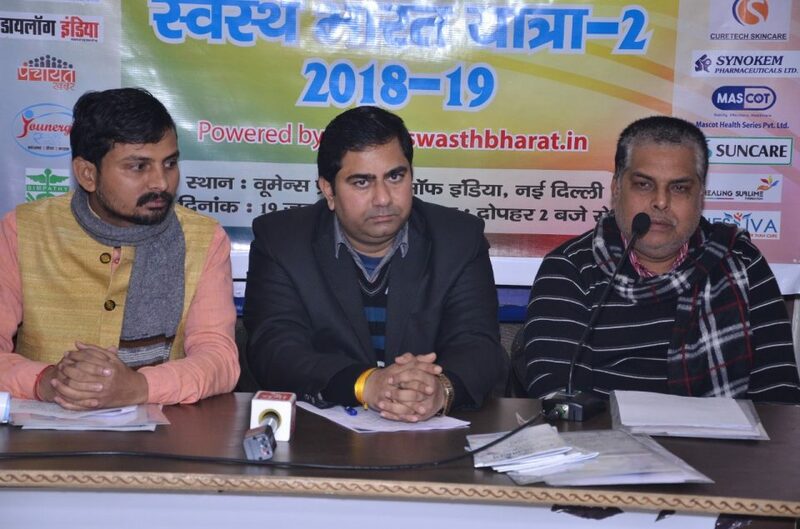 Journalist Ashok Priyadarshi, Educationalist Priyanka Singh, Vivek Kumar, Vimlesh Mishra Sambhu Kumar and many more Media friends are the supporting hand for coming Journey of Swasth Bharat (Trust). Senior Journalist and Co-ordinator of Media chaupal Anil saumitra is the National Coordinator Of this Swasth Bharat Yatra2. This Yatra is also being supported and guided by Sh. H. N. Sharma (Senior educationist ), Sh. Ashok Gadiya (Chairman of Mewar University), Dr. Anurag Aggarwal (Renowned orthopedic specialist), Dr. Manish Kumar (Senior Neurosurgeon), Dr. Alok K Mishra (Senior Brain Behavior Analyst), Sh. Arvind Kumar Singh (Senior Journalist), Dr Mamta thakur, Shashiprabha Tiwari, Dr. Abhilasha Dwivedi (Life and Wellness Coach), Sh. Subodh Kumar (Deputy Director of Brain Behaviour Research Foundation of India), Sh. Umesh Chaturvedi, Omprakash Tiwari and many more intellectuals. In this occasion Swasth Bharat Yatra-2 Song has also launched. Media coordinator of this yatra Ashok Priyadarshi said that this Yatra Geet Written by well known bollywood lyricist (Sanju fame) Shekhar Astitva & Music by Dhiraj Sen. Well known playback singer Nisha Mishra and Asha Gupta sung this beautiful Yatra Song ‘Swasth Bharat Ke Teen Ayam:Janaushdhi, Poshan Aur Ayushman…’.